Recently, I had a conversation with my blacksmithing mentor. The essence of the talk was about the final 10% of refinement that goes into a quality knife, but what we discussed can be applied to any art. The quality of any artist’s creation can be seen in that product’s transitions and terminations. This principle applies whether the art is visual, auditory, or physical. When making a knife, whether forged or ground, a knife consists of a point, edge, spine, guard or ferrule, and handle. Some of these counterparts are pure termination, like the point. Others, like the guard, are both transition and termination. Our lesson emphasized that a transition should be flowing, harmonious and, to some extent, soft or fluid, in a way that is pleasing both to the eye and the touch. A termination should be clear, crisp, making a definitive statement about the piece itself. If we look at the point of a knife it should clearly be a point unless the termination of the blade is designed specifically not to have one (like a butter knife for tableware). The point, the termination of the blade, the finish of the working portions of the tool should be expressly clearly, well defined. The knife makes a statement. My friend was trying to teach me to see something very important when producing quality art or craft. Viewing knives and the practice of knife making this way gives the artist clues to discerning quality workmanship. Like all important lessons, I might have gotten a glimpse. Training and attention to detail will develop the necessary skills. Quality, which is such a subtle thing to judge, can be seen in the transition and termination of any work of art. In painting, the artist transitions in color and shape create the final impression for the viewer. You experience this idea in written works such as books, poems and plays, in the structure of acts and verses, in the way tension is built and released in stories. In a piece of music, the choruses and bridges all flow from one to the next (transitions) to the crescendo and final note of the song (termination). Being both a Martial Artist and a visual artist, this conversation had even greater lessons for me than simply increasing my ability to make a quality tool. Consider something as simple as training a basic, for example, hammering inward and striking with the hammerfist. We have the movement’s description which is organized by the method, direction, weapon etc. This is the “what” of the movement, but as you look deeper into the principles the quality of an excellent “tool” is revealed. The weapon follows the dimensional sequence of muscle movement. This relates to how the proximal joint, the shoulder, hammers, and the more distal joint, the elbow, reaches its maximum comfortable distance in height, width, and depth. Finally, the fist finishes the movement by tensing at the moment of impact with the target, all harmonized with the breath, culminating with tensing the entire body, aiding the structural reinforcement of the weapon, as it impacts the target. When we view the process in this manner, we are beginning to study transition and termination in physical movement. This perspective can be used to study basics, forms, and techniques; all of our exercises. By applying these principles to your art, you can experience limitless refinements. 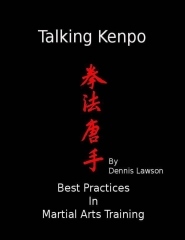 As martial arts instructors, we clearly see that beginners with limited knowledge of both the structure of the art and the coordination and structure of their bodies will have ragged transitions and unclear terminations. Beginners refine their motion by repetition in training and by developing greater ability to view their art through the prism of its principles. This process continues as the beginner grows into an intermediate, then, an advanced student. Principles like syncopation of motion, continuity of motion, contouring and the like, help define the difference between a beginning student and the advanced practitioner. The student refines his art by applying his deeper insight into principles and his concentration on training them. We clearly see this refinement of transitions and terminations from the second person point of view. When we watch advanced practitioners of the art perform a form or set their level of expertise is clear in their pauses, continuity, and punctuation for effect. The advanced practitioner embodies continuous motion that has a clear pace with refined principles. Like a well made knife, there is a harmony to each part of the performance and the relationships of all the parts together create a whole. We can train paying attention to our transitions and terminations to help define our sticking points, mumbled motion, hiccups or stutters. These things may simply be unrefined transitions, a lack of coordination, a lack of understanding from experience, or some combination. By paying attention to these issues, corrective adjustments can then be made. It would be an incomplete study of these principles to not mention their application to the art of living. But, that is a discussion for another article.